The D33 type began to replace the D32 vans from 1894 onwards. 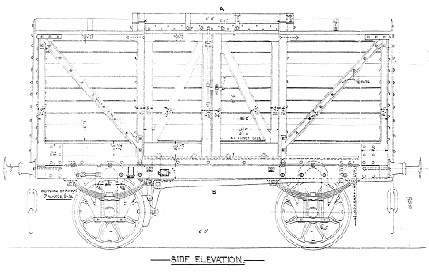 The new design was 16ft long in accordance with the new standard length of wagons, which had been adopted in 1889. The width and wheelbase remained the same. The roof door system was retained but a narrower, 5ft. wide, side door was added to the 'off-side'. The sketch by Ken Werrett published in 'Model Railway News' June 1963 helps to illustrate the body differences between the two types of van. Both types originally were rated to carry 7 tons and were fitted with split spoke wheels and 6 x 3in journals running in grease filled axle-boxes. The few which were upgraded later to a 10 tons capacity were fitted with brakes to all four wheels and would have needed larger journals running in oil-lubricated axle-boxes. Towards the end of their lives and with worn journals many others were downgraded to only 6 tons capacity. The brakes on D33 vans were fitted with a cast iron block when new rather than the wooden brake block, which characterised the D32s up until about 1890. The longer D33 continued in production until 1904 when it too was superseded by the 16ft D87 and finally in 1908 by the 18ft long D88. These later designs are also described. While the earlier D32 type was virtually extinct by 1923, some 5000 of the D33 vehicles passed to the LMS at the Grouping in 1923. We do not have records of their survival in LMS service, but from circumstantial evidence it is unlikely that many survived beyond the 1930s when even the youngest were thirty years old. 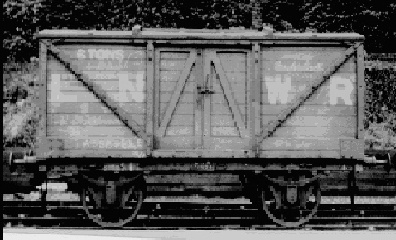 Register (running) numbers of D33 vans, as for most L&NWR wagons, are only known by virtue of a small number of photographs and a handful of written records such as minute book references to individual vehicles lost or destroyed. From photographs the following numbers are on record: 13811 [5.14.0], 29053 [5.19.2], 64450 [6.1.2], 64513 [illegible], 64542 [5.17.1], 65105 [illegible], 72053 [5.15.0], 72841 [illegible]. Additionally, there is strong evidence that the whole range of numbers between 12350 and 14514 were allocated to covered vans from 1863 to 1923, and would initially these would have been carried by D32s but in the later period many would have been transferred to D33s. D33 Covered van No.72053 photographed in the 1920s in North Wales displays the smaller off-side door. It has been reduced to 6tons, but it is in the final livery showing the letters LNWR without the two diamonds, which were situated on the plank below the letters in the centre of the panels. Shown above is the main door side elevation of a D33 covered van. It is taken from the original Earlestown Drawing No.65 [HMRS 1161] dated 28.2.1902. Although the length is labelled 16ft it still scales to 15ft 6inch presumably because a lazy draughtsman took the easy way out! Consequently, the drawing is dimensionally the same as that for the D32 van. Modellers beware!